Recycling Gold - Do Older or Newer Sources Give You the Greater Yield? I recently took a close look at the inner workings of an old stereo console that dates from the mid-1950s. It’s one of those “hi-fis” that were so popular back then. My wife and I inherited it from elderly relatives who passed away. We stuck it in our living room. It doesn’t work anymore and would probably cause a fire if we left it plugged in, but it starts conversations. 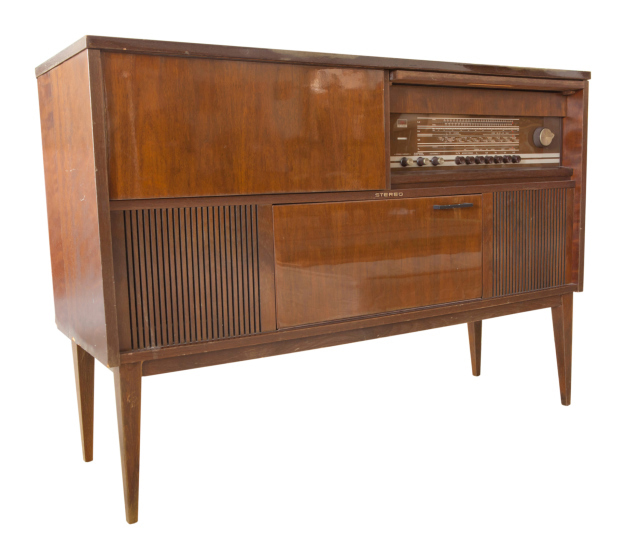 If you look inside, you’ll see that it contains an amplifier, a radio receiver, two big speakers, and even a turntable, all packed into a heavy piece of cabinetry. There are vacuum tubes, lots of wires, an antenna, and miscellaneous other components. But is there any gold inside? No, none at all. Does this old stero console have any gold inside? No, but other old items do. Image Credit: Withaya/iStock/Thinkstock. When you’re looking for gold to recycle, should you be looking for older sources, or newer? Let’s take a look at different sources of gold and see what applies. Gold appeared in greater quantities in consumer electronics when printed circuit boards arrived in roughly the mid-1960s. That explains why you will find quantities of recyclable gold in radios, remotes, stereo components and televisions made since then – and hardly any in older electronic equipment. Today, you can add cellphones, computers, CD and DVD players and drives to the list of places to look. So if you’re looking for gold in electronic equipment the rule is, the newer the item, the more gold you will find. Up until about the mid-1960s, eyeglass frames were often gold-filled, meaning that they were plated with thick layers of gold that can be profitably recycled today in our expert precious metal refinery. More recent eyeglass frames may still give off a golden sheen, but they are plated with much thinner layers of gold that have been applied by modern thin-film plating, not in the old way that applied gold in tanks. So if you’re looking for gold in eyeglass frames the rule is, the older the item, the more gold you will find. If you crawl around a car that was made in the 1950s, you won’t find any gold at all, because cars from that era did not have onboard computers that monitored engine and emission functions, transmission shifting points, antilock brakes, and other advanced components. Even the radios had vacuum tubes and needed time to warm up. But in the 1970s, onboard computers equipped with printed circuit boards appeared on cars and trucks. And those boards contain small quantities of gold. So if you’re looking for gold in junked cars, you’ll only find it on “modern” vehicles made since about 1975. Forty or 50 years ago, gold was commonly used in dentistry. There were gold fillings, gold wires that secured bridges to surrounding teeth, gold bars that served as anchor points for artificial teeth, and even gold caps. But today gold has all but disappeared in dentistry – the exception being that gold is still used by some dentists in Africa, Asia and Eastern Europe. So if you’re looking for gold in dental scrap, turn your attention to older sources like old dental laboratories and dental practices that are closing their doors. Here things get a bit complicated, depending on the kind of factory. If you’re looking at a factory that performed gold plating in tanks, you can often find recyclable quantities on tank walls, inside drainpipes, and adhering to filters and sponges. If you’re looking at more modern equipment that applied thin layers of gold, you can often find recyclable gold in sputtering targets that outlived their useful production lives. Yes, it’s complicated. But if you own plating equipment or supplies of any kind, give us a call at 800-426-2344 and we can explain how to test your items to determine their value. Please mention this post when you call and ask about free or discounted shipping on items you send to us for testing. I’m thinking about tearing out its inner electronics and replacing them with a modern stereo receiver, modern speakers and other new stuff. But then I look at it and notice that it is such a great time capsule - even if it contains no gold at all. Should You Recycle, Keep, or Sell that Old Gold Watch?